The sad news is coming out of Great Britain this morning that Edward Woodward, the accomplished actor who rose to prominence with the television series Callan in the late Sixties and his role as Neil Howie in 1973's The Wicker Man, then scored even more fame during the Eighties with the television series The Equalizer, has passed away at the age of 79. Woodward was a very, very good actor. His portrayal of Howie in The Wicker Man has always haunted me for some reason. But like many people I was especially awed at Woodward's ability to convey "controlled rage". 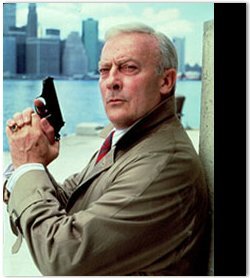 Robert McCall, his character in The Equalizer, was a man with James Bond's dirty tricks combined with Batman's thirst for justice. The last time I saw Woodward in anything, it was in the ill-fated Babylon 5 spinoff show Crusade: he played a Technomage who was the father of series regular and fellow Technomage Galen (who incidentally was played by Edward Woodward's real-life son Peter Woodward). Thoughts and prayers going out to his family this morning.